More than 12 years ago the siren song of gold captured the attention of my husband Chuck and myself. 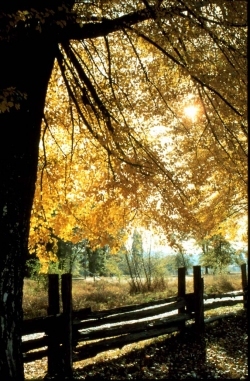 Since that time the song has not diminished, but grown stronger with the years as we have searched the wilds of the San Gabriel Mountains, the ancient rivers of the Mojave Desert, and worked our way to the northwest to retire in the beautiful Siskiyou Mountains in a little town called Happy Camp. Our first glimpse of gold in the San Gabriels was just that, a glimpse; flecks of gold so small we called them gnat’s eyelashes. Our fever was so strong that even those minute specks of gold brought shouts of joy. But as we read and practiced our panning and gold finding techniques, the amount of gold we recovered became larger and so did our longing for more! We have gradually expanded our gold-finding equipment from a pan & sluice box, to include a drywasher, a motorized sluice, a Goldmaster V/S.A.T. metal detector and a 5″ dredge. Not satisfied with ordinary equipment, Chuck began modifying our sluice box. Then he graduated to what I call “The Awesome Dry Washer.” It was built entirely of wood, with a recovery system of 97 percent — which is unheard of in processing dry gravels. This machine is so beautiful I used to drag my friends out to our garage and allow them to gaze at it in wonderment! Chuck’s real love, however, is his motorized sluice. Of course, he has also redesigned it — vastly improving the recovery system and allowing easier handling of the nozzle when dredging. Sometimes I wonder if gold miners have more fun redesigning and working on the equipment than they do in using it! 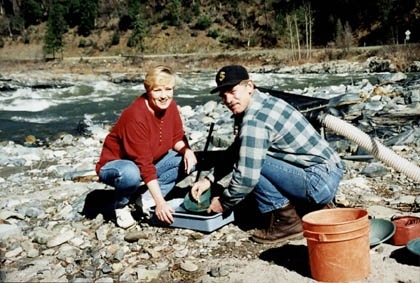 We had decided to come to Happy Camp on a one-week vacation when friends sent us some pictures of gold they recovered while panning on the Klamath River in northern California. Their stories, along with the pictures, convinced us the 16-hour drive from southern California would be worth it. Chuck and I had already spent a great deal of time visiting many beautiful and remote areas of California. But nothing had prepared us for the beauty of Happy Camp! The moment we left Interstate 5 and turned onto Highway 96 just north of Yreka, we already knew it was worth making the trip. We had never seen anything so beautiful in all our lives as the Klamath River. Everywhere we looked we saw great blue herons fishing for their dinner, flocks of Canadian geese, and osprey, which we first thought were eagles. Beautiful pine trees lined the highway, the dogwood was in full bloom, and the brilliant flowers looked like bright lights in the forest. We weren’t on the river 15 minutes before we had to stop and watch a family of river otters playing on the far bank of the river. And we knew we had found heaven on earth! Shortly thereafter, we joined the New 49’ers Prospecting Organization and also found more gold than we had found on our previous adventures. By the time our vacation was over, we knew we would be coming back to Happy Camp permanently! Within two years, Chuck took early retirement from his 20-year career as a big-rig driver. We sold the house, bought a fifth-wheel, and moved to Happy Camp. I had already taken early retirement from my many years in the field of accounting. Our kids were grown and gone and we split! We found a place to park our new 34-foot “home” in Happy Camp and proceeded to immediately beat a path to the Klamath River. The first area we worked our motorized sluice was in the Independence area. 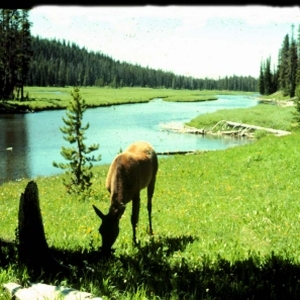 This is located about 18 miles down river from Happy Camp. Even though the Club has an extraordinary amount of mining property which is easily accessed, for our first prospecting adventure, Chuck and I picked a more remote location. This required us to hike a half mile on a narrow deer trail several hundred feet above the river carefully balancing our equipment. The spot was great! 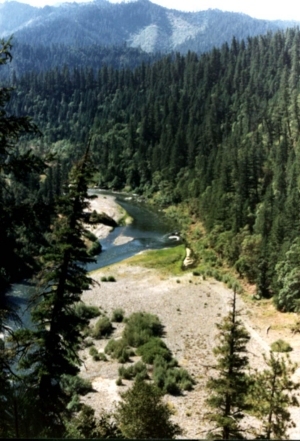 Over a period of six weeks, we found a large quantity of fine Klamath River gold. One of the nice things about Happy Camp is all the fun and interesting people you get a chance to meet. One time, upon arriving at our diggings, I was dumbfounded to find a large banner reading “Happy Birthday Kay, ” which had been strung across the beach by one of our new-found friends. He had gotten up before dawn in order to get to the site and hang the banner before Chuck and I arrived. Nobody had ever done anything like that for me before, and I was deeply touched. Over time, a lot of fellow New 49’ers and other gold miners in the area were so impressed with the changes Chuck had made to his own motorized sluice, that they began asking him to make the same changes to their equipment. This kind of set a whole new standard. That’s the thing about having a lot of different people involved in an activity. When somebody comes up with something good, others grab onto it and make some other improvements; and that’s how progress is made, I guess. Anyway, everyone around here is pretty proud of Chuck. More recently, we bought our first dredge, had wet suits made, and began our dredging career in Elk Creek — where the water is safe and shallow. Chuck rapidly adjusted to being under water, but it took me a little longer. We moved our equipment to the Klamath River once we had perfected our technique and felt confident. After about a year on the river, I decided it was about time to get involved in something which would also challenge my intellectual abilities — something like a job. Luckily the New 49’ers had an opening and I joined the staff. I really enjoy the work and meeting so many wonderful people, helping them with vacation plans and sharing in the excitement when they find their own gold. My primary duty is to help people join in the fun and excitement which is taking place in Happy Camp; when you call the New 49’ers on the phone, it’s likely I’m the one you’ll be talking with. Chuck is out prospecting on the river almost every day and I join him on the weekends. It’s kind of like having the best of both worlds! Hardly a day passes that something exciting doesn’t happen around here. With so many different people hunting around looking for some new and exciting gold strike, there is always a sense of anticipation. It keeps life interesting. Not long ago, I was talking with a member on the phone when I looked up and saw Chuck standing at my window dripping wet. When I got off the phone, he told me to hold out my hand and dropped a 7.8 pennyweight nugget in it. I now wear this nugget around my neck! Happy Camp has turned out to be everything we had hoped for — a slower pace (a traffic jam is more than two cars on the road at one time), very friendly people, we’ve made lots of new friends, and there is gold here. What more could you ask? So if you think you might like to visit the area, call me; I’ll make sure you feel welcome when you arrive!